Who are Interested Men Candidates from six districts of Andhra Pradesh Srikakulam, Vizianagaram, Visakhapatnam, East Godavari, West Godavari, Krishna and one district of UT Puducherry Yanam who would like to participate in Kakinada Rally Bharti 2018 for Joining Indian Army. Rally Venue: District Sports Stadium, Kakinada (AP). Name of the Posts Soldiers, Clerk, Tradesman, Nursing Assist. Eligible candidates may apply online at Indian Army's website (direct link is given below) from 21st May 2018 to 20th Jun 2018. The Indian Army Recruiting Office (ARO) Visakhapatnam is going to Host an Open Recruitment Rally (Bharti) at District Sports Stadium, Kakinada, East Godavari (AP) from 06th to 15th July 2018. The eligible candidate can register in online from 21st May 2018 at www.joinindianarmy.nic.in. Candidates selection will be based on Physical Fitness Test (PFT), Physical Measurement Test (PMT), Medical Examination, Common Entrance Examination. Age Limit: As On 01 October 2018. Soldier GD:- Interested Aspirants should be between 17.5 to 21 Years of Age. OR Born Between 01-10-1997 to 01-04-2001. All Other Posts: Candidates should be between 17.5 to 23 Years of Age. or Born Between 01-10-1995 to 01-04-2001. Height: Minimum Height for Soldier SKT/Clerk Posts is 162 cms. Minimum Height for All Other Post is 169 cms. Chest: Chest should be minimum 76 cms for Soldier Tradesman and 77 cms for All Other Posts with the expansion of 05 cms. Weight: Weight should be minimum 48 kg for Tradesman Post And Minimum 50 kg for All Other Posts. For ST Category minimum Height is 162 cms and weight is 48 Kg. 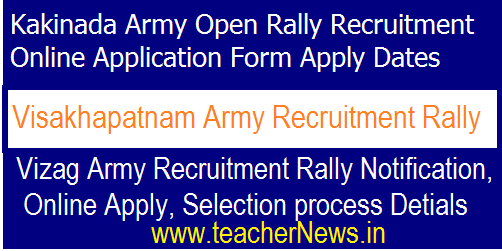 Visakapatnam Army Open Recruitment Jobs Notification Details 2018 Indian Army Vizag Open Bharti 2018 ARO HQ Kakinada Army Open Rally, Online Registration, Bharti Date.